Picture the scene – it’s mid-afternoon on Sunday 11th April 2004, the venue is the Antigua Recreation Ground and it’s Day Three of the fourth and final Test match between England and the West Indies. It’s Easter Sunday and the sun’s beating down on the rickety, packed West Indies Oil Stand, which has become the place to be. Just before lunch, Brian Lara scored a record 400 not out and everyone in the ground, West Indies and England supporters alike, enthusiastically acknowledged his fantastic and historic achievement. It was one of those sporting moments you know you’ll never forget – the emotion, the camaraderie, the “just being there” as part of the crowd. Now England are batting and the time has come to let the players know we’re right behind them. And so it begins, a chap dressed in a leopard skin toga with his face painted with the flag of St George starts the refrain with “Everywhere we go-o . . .” and the whole contingent of England’s supporters, all around the ground join in, word-perfect. The song ends with a rousing chorus of “Michael Vaughan’s Barmy Army, Michael Vaughan’s Barmy Army, Michael Vaughan’s Barmy Army . . . “ And so the chant goes on, comfortably breaking Day Two’s 20 minute record and setting the benchmark for Day Four’s efforts. We’d better put in some practice on the bus on the way back to the hotel . . . 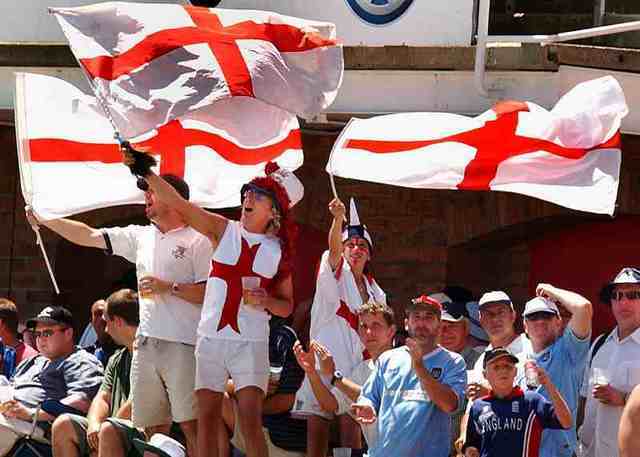 Even if you’ve never actually attended an international cricket match when England are playing you’re likely to have heard of the Barmy Army. If you’ve ever watched a televised England match, you’ll most certainly have seen and heard the Barmy Army – that colourful, noisy band of supporters that adds the unique atmosphere that has become the hallmark of the modern international game. It has become something of a tradition to see the Pink Panther and Sylvester the Cat watching cricket in all the world famous cricket grounds. That those two characters have arguably become one of the most visible representations of how spectators engage with sport communicates a powerful message about the accessibility and appeal of cricket. This is what the Barmy Army is all about, but perhaps more importantly as far as cricket and sport generally is concerned, they have become an immensely powerful sports public relations mechanism, raising awareness of cricket as a form of entertainment and attracting a new and younger audience to the game whilst simultaneously debunking some of cricket’s outdated stereotypes. Public relations’ role within contemporary sports business is creating a new dynamic for this communication discipline and opportunities are emerging for people who want to combine their love of sport with public relations practice. The public relations academic literature rarely refers to sport apart from in relation to sponsorship activities and completely neglects the wider potential of public relations in areas such as sports relationship management, sports community relations, sports image and identity creation and sports marketing public relations. For those who want to study sports marketing communications further, it is necessary to turn to the sports marketing literature, but even here, sports public relations has only very recently started to be mentioned, usually in terms of sponsorship and media relations, and its wider value and potential is yet to be fully realised. In their book Strategic Sport Marketing Shilbury, Quick and Westerbeek (2003) view public relations as a critical component of the sports marketing communications mix and they have devoted a complete chapter to the subject because they say: “This is an important tool for the sport marketer because of the high visibility and attractiveness of the sport product.” (p.267). According to Helitzer (2000) sports administration, together with computer science, has been one of the most dynamic growth industries of the past 25 years but regarding sport as a business, at least in this country, has been a very slow process. Having to compete on business terms, however, has meant that sports organisations are having to consider their communications strategies, amongst other things, much more critically and public relations is emerging as a vital commodity. Having passionate supporters on your side can give sports organisations real public relations competitive advantage, particularly when they are as photogenic, media friendly and well-behaved (for the most part) as the Barmy Army. Regular visits to the discussion forum on the Barmy Army’s official website at http://www.barmyarmytravel.com/ shows that there is a constant influx of new “recruits” to the ranks who are keen to actively display their love for cricket and to participate in the welcoming party being organised for the Australians coming over for the eagerly anticipated Ashes series later this year. It was, after all, the Australian media via an article in the Sydney Morning Herald which originally coined the name “Barmy Army” as a grudging term of respect for the hordes of touring English fans whose unstinting vociferous support for their team in the face of defeat after defeat during the disastrous 1994-95 Ashes tour was a source of constant amazement to the Australians for whom losing at any sport particularly cricket, is inconceivable. During that same tour of South Africa, a local supporter wrote in a letter to the Cape Times: “It’s incredible that the same country that can spawn soccer hooligans can also produce cricket lovers whose enjoyment of the game is a pleasure for all to experience.” How’s that for third-party endorsement? And what do the players think about the Barmy Army? Well, they love them and say they can be a real boost to the team when things are flagging a bit. Matthew Hoggard reckons that they have a big effect on the team, especially when times are hard and energy levels are low. “Sometimes, that little thing of supporters giving you that bit extra keeps you going. We really appreciate their support”. Standing next to some of the England players on the pitch at the end of the Antigua Test and watching them clap their approval of the Barmy Army and taking photos of the mass of riotous support in the West Indies Oil Stand was further evidence, of what the players think. Perhaps one of the most appealing features of the Barmy Army is that anyone can “join”, regardless of age and gender. There are no membership fees to pay, you just turn up to a match and join in with the fun – the only provisos are that you like cricket, you bring your sense of humour with you and you are prepared to have a television camera thrust in your face. The Barmy Army’s Mission Statement, emblazoned on the website, is “To make watching cricket more fun and much more popular.” So, if you want to see 21st Century cricket at its best and most fun, spend a day in the company of the Barmy Army this summer. You don’t have to paint your face, wear a wig or dress strangely, but it helps if you can take the trouble to learn the “Barmy Army Anthem” – that’s the one that starts “Everywhere we go-o. . .”, you’ll find the words on the website. Oh, and if you find yourself standing next to a chap in a bright orange wig who answers to the name of Hogwart, say hello from me! I want to know is there any official body working for the army and is it having any official logo??????????? ?